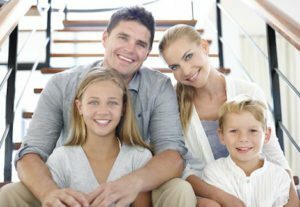 At Uptown Guelph Dental, we strive to accommodate all of your family’s smile needs. 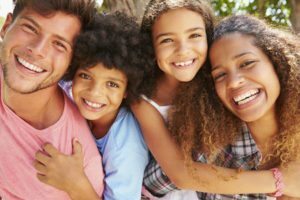 With a team of associate family dentists and general dentists with expertise in pediatric dentistry and periodontics, we have all of the services that you and your children need for a healthy smile. Dental Crowns, Bridges, and Dental Veneers — Porcelain restorations add integrity and protection to teeth that have been impacted by chips, fractures, decay, and stain. And when they need to be replaced, a dental bridge may be the perfect alternative to getting an dental implant! Gold Restorations – Gold fillings are less prone to fracturing and can be polished to a very smooth surface, making it more difficult for plaque to accumulate on the restoration. Gold also tends to be more supportive of the enamel and offers excellent longevity. White Composite Fillings – We also offer white composite tooth fillings. The tight bond between the restoration and your tooth helps to prevent bacteria from sneaking in between the two and damaging your tooth. Plus, these tooth-colored fillings provide an alternative aesthetic to the traditional metal filling. Replacing Your Missing Teeth — Choose between options like dental implants, dental bridges, partials, or dentures to fill in the spaces left by missing teeth. All-on-4 and implant supported dentures are also available! Wisdom Teeth Consultations — One of the common oral surgeries that we perform is extracting wisdom teeth. We offer free consultations (X-ray fees may apply) to help you get the answers that you need. Restoring Worn Dentitions — No matter what your smile has been through, we’re equipped to help you restore and replace your teeth as necessary. It might be something as simple as composite buildups or more complex like dental implants, but we offer everything you need. Oral and Periodontal Surgery — Our general dentist with expertise in periodontics performs numerous oral surgeries at our practice. We even offer sinus lifts, flap surgery, bone grafting, and soft tissue grafting alongside of more routine surgeries like dental implant placement or extractions.